There any many different 27″ 1440p 144Hz IPS gaming monitors available on the market. For many, this combination of specifications delivers the perfect gaming experience and we can certainly see why. If you are looking for the most affordable monitor that ticks all these boxes, your search is over. The new Pixio PX277 is the cheapest such model yet it offers AMD FreeSync with a wide dynamic range, a slim bezel-less design, and additional useful gaming features. Keep in mind that this review is of the 2017 model Pixio PX277, not the older model from 2016 which goes by the same name and is now discontinued. The Pixio PX277 2017 model is also referred to as the Pixio New PX277 or Pixio PX277-N.
First of all, the 2560×1440 resolution ensures vivid details and plenty of screen real estate thanks to the rich pixel density of 108.79 pixels per inch. The pixels are not individually distinguishable at all as they are on 24″-27″ 1080p monitors, and you don’t need to scale your UI like you’d need to do on 24″-32″ 4K monitors. With 1440p at 27″, you hit the sweet spot. Moving on, the IPS panel of the Pixio PX277 display offers wide 178-degree viewing angles, a 6ms response time, a 230-nit peak brightness, and a 1,000:1 static contrast ratio. The colors are vibrant and consistent covering a bit over 96% of the sRGB color gamut meaning that you won’t be able to use the screen for color-critical work, but the image is crystal-clear with vivid colors nonetheless. The Pixio PX277 1440p 144Hz gaming monitor delivers an outstanding performance with the average input lag amounting to just below 10ms making it perfect for competitive gaming. Now, the response time speed of 6ms is slightly higher than the usually-advertised 4ms of certain modern IPS panels, but in reality, there’s hardly any ghosting of fast-moving objects noticeable. Of course, if you want as little ghosting as possible, you should go with a TN panel monitor instead, but then you’d lose on color quality and viewing angles. We didn’t run into any defects such as excessive IPS glow or dead pixels. The screen is flicker-free and has a low blue light filter, so it won’t cause you headaches or eye fatigue even after prolonged use. 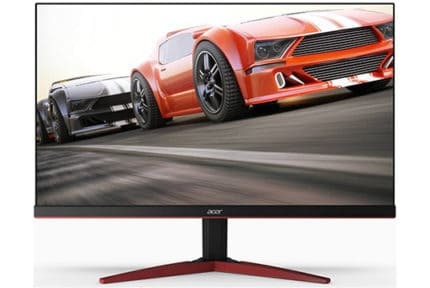 At 144Hz, gaming feels considerably more responsive and immersive as opposed to the standard 60Hz displays which in addition to the striking colors and crisp details ensures an overall flawless gaming experience. 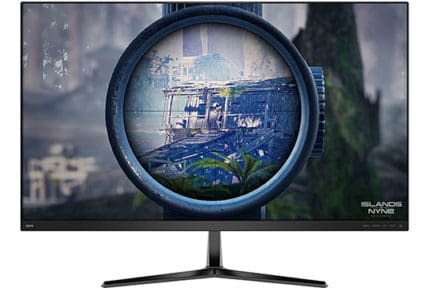 One of the more impressive features of the Pixio New PX277 27-inch monitor is AMD FreeSync; more precisely, its wide dynamic range of 30Hz to 144Hz given that FreeSync monitors usually have a more limited range of around 40-144Hz or 48-144Hz. In fact, the previous PX277 model had a range of 55-144Hz. 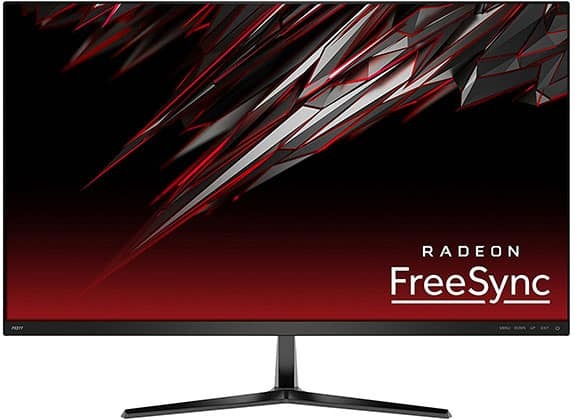 If you have a FreeSync-compatible GPU connected to a FreeSync monitor, the refresh rates and frame rates become synchronized – similar to how V-SYNC works. However, instead of waiting for GPU’s frame rates, the monitor changes its refresh rate dynamically thus eliminating the awful screen tearing and stuttering without introducing input lag. In case you have an NVIDIA card, you can still use the Pixio PX277 1440p 144Hz FreeSync monitor but you won’t benefit from FreeSync. If you want the variable refresh rate with a GTX card, you will need a G-SYNC monitor, but these are a bit more expensive. To clarify Pixio’s misleading information on the product webpage (pictured below), note that the Pixio PX277 FreeSync range amounts to 30-144Hz over the DisplayPort, but FreeSync is not supported over HDMI. 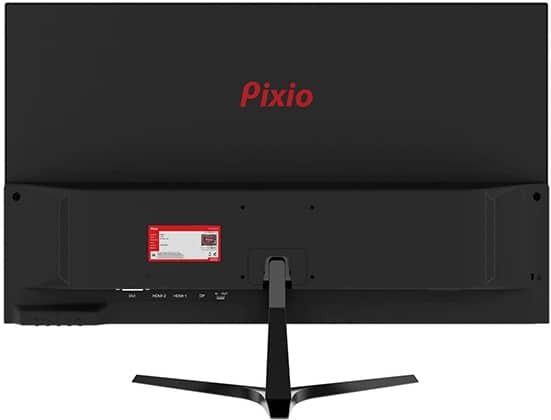 Other Pixio PX277 gaming features include the ‘LOS’ customizable crosshair overlays and Game Timer which places a timer on the screen for tracking cooldowns and pizza deliveries. There’s also an FPS and an RTS picture preset with optimal settings for these gaming genres in addition to the Standard, Photo, Movie, and one customizable preset. There are no Picture in Picture and Picture by Picture modes while the Pixio PX277 color settings include color temperature presets, and red, green, and blue color adjustments for calibration. Enabling the OverDrive setting increases the response time speed of the monitor from 12ms to the advertised 6ms. It’s also important to note that FreeSync and OverDrive can be enabled at the same time. So, you won’t be limited to 12ms response time when you turn on FreeSync. Unlike the older Pixio PX277, the new model boasts a slim design with ultra-thin bezels for a more cinematic viewing experience. The chassis is matte plastic and there’s a matte screen coating against light reflection. Alas, the screen is tilt-only, but there’s a 75 x 75mm VESA mount compatibility. Connector ports are as follows: a DisplayPort 1.2, an HDMI 1.4, an HDMI 2.0 (HDMI-1), a DL-DVI, a headphones jack, and an audio line-in for the integrated speakers. Keep in mind that the Dual-Link DVI can’t reach 144Hz at 1440p, so use either HDMI 2.0 or DP 1.2. The Pixio PX277 price amounts to $399.99 MSRP. You may also be interested in the Pixio PX277H which has FreeSync 2 (works over HDMI) and HDR10 support, but a lower dynamic range and thicker bezels. The Pixio PX276 is identical to the PX277 but has a TN panel with a 1ms response time. So, if you mainly play competitive fast-paced games, you should go for it instead. On Amazon, you will also find 32″ VA-panel Pixio monitors with excellent price/value. These include the Pixio PXC32 1440p 144Hz curved, the Pixio PX325c 1080p 144Hz curved, and the Pixio PX329 1440p 165Hz flat models. The Pixio PX277 27-inch 2560×1440 144Hz IPS gaming monitor offers an impressive performance, image quality, and features for its price and we highly recommend it, especially if you have an AMD RX Vega card. Even if you have a powerful NVIDIA card, the monitor’s a great choice considering that a 27″ 1440p 144Hz IPS G-SYNC monitor will cost you at least an extra $250. The Pixio New PX277 is the cheapest 27" 1440p 144Hz IPS FreeSync gaming monitor yet it offers a wide variable refresh rate range, additional useful gaming features, and a slim design with very thin bezels.